Photojenic's Collection of Amateur Foam Board Inserts. 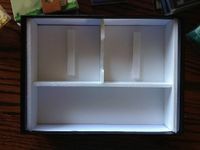 I've seen lots of wonderful examples of foam board inserts on BGG, especially 28green's Geeklist, and so I thought I'd start a Geeklist of my (very) amateur attempts. I watched the excellent videos by UniversalHead, purchased some supplies and started making a few of my own. My general list of supplies: Foam Board; utility knife with breakaway blades; 12 inch metal ruler with inch and cm/mm measurements; medium self-healing cutting mat; Aleen's fast-grab tacky glue; and sewing pins. Entries below are the inserts I've made in chronological order, with pictures and lessons I've learned along the way. I won't be posting any specific details like measurements because I'm mostly winging each one, hence the "amateur" results. I usually make them when the insert that comes with the box is either non-existent, doesn't really organize the bits very well (ie: slides all over the box), or if I add an expansion or sleeve cards and the original insert no longer holds the bits. This list is mostly for me, but feel free to comment! Please check out 28green's Geeklist, who inspired me to create my own. Thanks! My first attempt and making a custom foam board game insert. When I sleeved the cards they no longer fit in the tray but and sliding all over the box. My first attempt is kinda rough, but works. I also found the little boxes at Michael's, which work great for holding the gems! They were in the bead section, and game 6 to a set. They are stackable, and have latching tops, which I really like. I went the cheap route and got my foam board at the dollar store. It seems sturdy enough, but difficult to cut. Could be my lack of skill though, too. Insert: The foam strips go under the cards to help it make them easier to get out. Seems to work okay so far. Second attempt. When I sleeved the cards for the base game, they no longer fit in the included insert. I "cheated" a little bit and didn't make this insert with sides. But since I'm not planning on pulling it out during play I don't think it matters. I'm wondering though, if I'm leaving too much room around the cards. 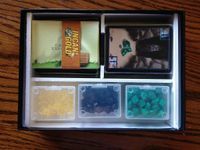 I used another little plastic box for the smaller bits, and made sections for the voting chips. There is just enough room on top for the rules and mission cards. Insert out of the box: see, no sides.